In the Federal Republic of Germany responsibility for the education system is divided between the Federation and the Länder. The scope of the Federal Government's responsibilities in the field of education is defined in the Basic Law (Grundgesetz). Unless the Basic Law awards legislative powers to the Federation, the Länder have the right to legislate. Within the education system, this applies to the school sector, the higher education sector, adult education and continuing education. Administration of the education system in these areas is almost exclusively a matter for the Länder. In addition to the division of responsibilities described above, the Basic Law also provides for particular forms of cooperation between the Federation and the Länder within the scope of the so-called joint tasks (Gemeinschaftsaufgaben). Early childhood education and care is not part of the state-organised school system in Germany but almost exclusively assigned to the child and youth welfare sector. On the federal level, within the framework of public welfare responsibility lies with the Federal Ministry for Family Affairs, Senior Citizens, Women and Youth (Bundesministerium für Familie, Senioren, Frauen und Jugend – BMFSFJ), on the level of the Länder, the Ministries of Youth and Social Affairs and, in part, also the Ministries of Education and Cultural Affairs, are the competent authorities. As a rule, in the year in which children reach the age of six, they are obliged to attend primary school. All pupils in Germany enter the Grundschule which in almost all Länder covers grades 1 to 4. 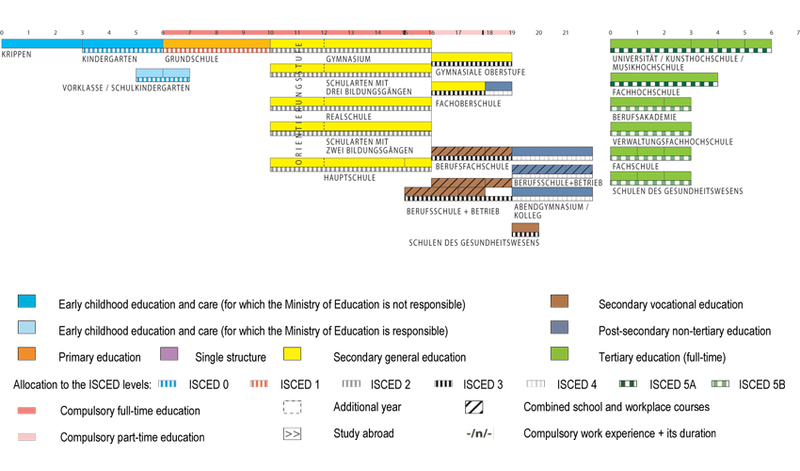 Following the primary school stage, secondary education in the Länder is characterised by division into the various educational paths with their respective leaving certificates and qualifications for which different school types are responsible. Once pupils have completed compulsory schooling they move into upper secondary education. The range of courses on offer includes full-time general education and vocational schools, as well as vocational training within the duales System (dual system). The tertiary sector encompasses institutions of higher education and other establishments that offer study courses qualifying for entry into a profession to students who have completed the upper secondary level and obtained a higher education entrance qualification. As part of lifelong learning, continuing education is assuming greater importance and is increasingly becoming a field of education in its own right. In response to the vast range of demands made on continuing education, a differentiated structure has been developed.